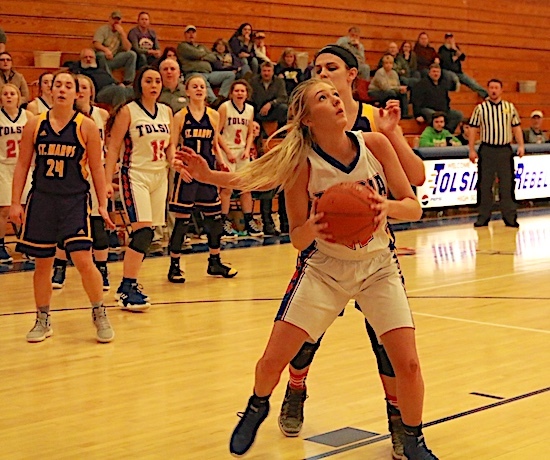 LOUISA, KY. — Lawrence Co. ( 15-8 ) held on for a 48-44 victory over Tolsia ( 11-5 ) in Girls basketball action Tuesday night at the Dawg House. Lawrence County’s Lexi Ratliff launches a corner three in girl’s basketball action. The Lady Dawgs jumped out to a 24-13 lead at halftime and led 39-21 with 7 minutes to go before the Lady Rebels made a furious rally but came up just short. Kensley Feltner tallied 15 points and Lexi Ratliff finished with 11 points to the victors. Brooke Neal hit 2 three pointers for 6 points, Kyleah Ward 5 points, Kylie Maynard 3 points, Sheree Hay and Kaison Ward 2 points apiece. LCHS went 6-10 from the line and hit 3 three pointers. Julie Boone led the Lady Rebels with 18 points, Sarah Jude netted 10 points, Lynndsey Cassell just missed double figures with 9 points, Selena Browning tallied 6 points, Jace Litton chipped in with a free throw. Tolsia’s Sarah Jude going up for a shot against St. Mary’s. THS hit 2 three pointers and went 9-20 from the foul line. FORT GAY, WVA. — The Lady Rebels fell behind 13-0 in the semifinals of the WV HIT and fought back before halftime to make it a game Saturday afternoon at Rebel Arena. In the third quarter St. Mary’s out scored Tolsia 16-8 and that was the difference in the ballgame. THS hit 3 three pointers and went 4-6 from the line. VAN, WVA. 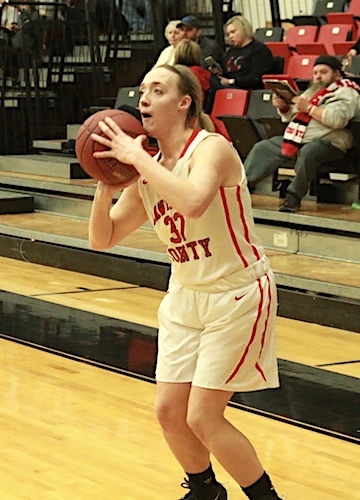 — Tolsia made the long trek to Boone Co. and came away with a big Section victory as Lynndsey Cassell poured in a career high 22 points as 13 different Lady Rebels dented the score book. Sarah Jude tallied 8 points, Kylea Pollinger scored 3 points, Julie Boone, Selena Browning, Katelyn Kelly, Elizabeth Johnson, Kenzie Young, Jace Litton, Becca Castle, Hayley Castle, and Isabella Simpkins all scored 2 points each, Trinity Muncy hit a free throw for 1 point. THS hit 2 three pointers and went 10-13 from the line. 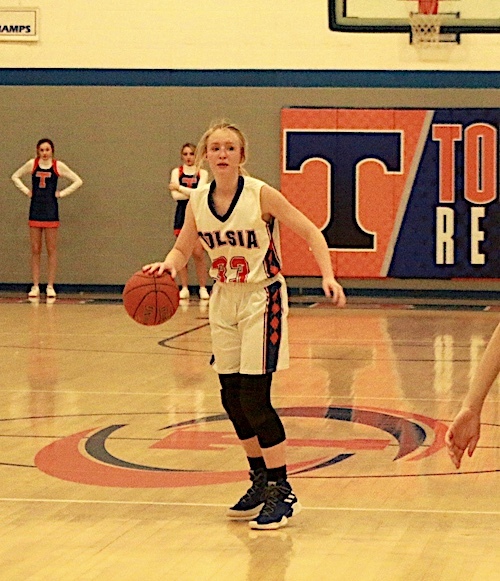 Tolsia will travel to Tygarts Valley Saturday afternoon at 3:00 for the Third place game in the West Virginia Hometown Invitational Tournament. Lawrence Co. will travel to Floyd Central for a Girl/Boy Doubleheader beginning at 6:00 Tonight.